As we approach one of the most hotly contested midterm elections in memory, we already know one winner: digital advertising has clearly emerged as the preferred medium for both candidates and voters. Digital advertising technology has continued to advance almost as fast as the political landscape, providing campaigns with more options than ever to effectively reach their audiences. But campaign strategists will also need to keep a close eye on the regulatory environment as regulators sort through potential concerns brought to light in the 2016 election cycle. This environment demands a digital ad strategy that is equal parts advanced technology and human intuition. With more than 15 years of experience in helping political campaigns and organizations successfully navigate this ever-changing landscape, Division-D has built its business by helping political advertisers identify the right strategies to reach voters who are increasingly mobile and constantly immersed in content. Seizing the big-screen digital opportunity. Connected TVs (or CTVs) have opened a range of new opportunities for political advertisers, including more targeted traditional ads and pre-roll video ads. These new types of ad buys deliver the best of both the digital and traditional TV advertising worlds – a more captive and attentive audience and watching on a big screen, but with targeting for relevance that isn’t possible with traditional broadcast buys. Making the digital-local connection. Particularly in mid-term election years, localized advertising is key. We’re seeing increased demand for its scalable network of local and regional newspaper and broadcast news websites. In addition to seeking strong reach across local channels, political advertisers are also looking for more finite geotargeting capabilities. If a congressional campaign needs to reach just one side of a city or county via a local outlet, the combination of a strong local news presence and hyperlocal geotargeting helps ensure no ad impression is wasted. Cutting through the display ad clutter. We’re also seeing renewed interest in higher-impact ad formats like the Rising Star Billboard, which covers the entire width of the page, as well as the interstitial ad, which loads between pages in a separate window. These formats have proven to deliver strong engagement compared with traditional display ads. Targeting messages to the right voters, at the right time.Voter file targeting and voter affiliation targeting continue to advance, enabling advertisers to get their message in front of the right segment of voters at the right time. For example, a candidate may want to focus their message on likely undecided voters in the midst of a campaign, then shift to their likely base to help get out the vote as the election nears. This type of targeting has been common for the past several election cycles, and continues to improve over time. Campaigns and interest groups that focus their strategies in these emerging areas, while also maintaining the flexibility to navigate a changing regulatory environment, will be well-positioned to share their messages with the highest levels of efficiency and impact throughout the midterm election cycle. Wells Fargo’s integrated marketing and advertising campaign, called “Re-Established,” seems to be rebuilding the company's giant consumer trust problem with help from Oath, digital content and ads after the company found some 3.5 million potentially fake bank and credit card accounts in 2017. “It’s probably one of the largest investments the company has ever made on an advertising campaign,” acknowledges Michael Lacorazza, executive vice president and head of integration at Wells Fargo. Well Fargo’s marketers measure operational messages such as click-through rates and attitudinal sentiment about the brand, such as awareness of the message of the campaign. It also measures the probability that the consumer will continue to do business with Wells Fargo. The digital part of the campaign is running through regular and programmatic channels. “Building the brand really does matter; it does lift all boats,” said John Piontkowski, vice president and industry lead of finance at Oath, refereeing to the lift from digital and programmatic campaigns. The Ad Council is introducing its first-ever story-driven chat experience on a mobile platform to raise awareness about the consequences among those that drink and drive underage. The “Ultimate Party Foul” chat story — hosted on Facebook Messenger and supported with donated media from Facebook — invites users to join a group chat with teen characters and actively participates in the story by responding to conversation prompts. The user gets to know the characters as they plan and attend a party, with one ultimately driving home after drinking. The story concludes the next day, when the rest of the group learns that this character has lost his driving privileges, faces legal fees, and now has to worry about how an arrest record will affect his college applications. This Snaps-designed chat experience is part of the ongoing Underage Drinking and Driving Prevention campaign from the Ad Council, which also includes TV, radio, outdoor, and digital PSAs supported by donated media nationwide. The campaign directs young people to UltimatePartyFoul.org for more information about how to avoid drinking and driving underage. Warner Bros.’ DC Comics division has opened sign-ups for its upcoming DC-branded streaming video and comic books service, DC Universe. Pricing and launch date for DC Universe are still TBD, but users can now plug in their email and get in line to try out the beta version of the service. Beta access will start in August. DC Universe will feature a slate of original shows based on DC Comics characters, as well as a library of classic TV series and movies, such as the “Batman” animated series, and the “Superman” movies starring Christopher Reeve. Original shows will include “Doom Patrol,” “Harley Quinn” and “Titans,” a live-action take on the “Teen Titans” animated series. It will also feature a digital archive of DC comics, a community element, and exclusive merchandise. At launch, the service will be available on the web, on smartphones and on connected TV devices like Roku and Apple TV. So far, most of the niche streaming services in the market aggregate library content around niches like British television or horror movies, but DC Universe is one of the first to be built around characters from a well-established and still growing universe. published last week . In it, the WFA outlines some ways to improve (rebuild?) the relationship between marketers and media agencies. That is a lofty aspiration in our broken-trust world. So what are the eight “commandments”? 1. Zero tolerance for ad fraud, with compensation for breaches. 5. Third-party verification and measurement. 8. Improving the user experience. These are all absolutely relevant and necessary topics to address. “Why should brands pay for ad fraud breaches? Why should we support a flawed ecosystem?” asks Leana Less, vice president global connections and media, The Coca-Cola Company. And Jerry Daykin, head of global media partnerships at Diageo, says: “Behaviors which seek to limit the access of our technology or to withdraw our data are totally unacceptable. Rejecting third-party, impartial measurement standards is inadmissible.” (All quotes come from the WFA document). I think at least all marketers can agree with these statements. The challenge is that while the charter lays out clear principles and demands and clarifies which industry initiatives the WFA supports on each of these issues, it's unclear what happens if the rest of the industry does not play ball. Obviously, this charter indirectly also implicates the media supply side and the middle-men ecosystem, but fails to mention any sanctions or punishment. This lack is probably expected from an industry body, here to try and coax the wider media industry partners into adoption, rather than to “shock and awe” partners into action. Another concern is that the consumer comes last in the WFA document -- it's number eight on the list. I would have made this number one, because even with all the other issues resolved, if consumers don’t engage with the content they’re offered, there is no point in addressing viewability, for instance. And, as we know, there are disturbing trends in consumer engagement with media. Trust in traditional news media is waning. Facebook engagement is slipping in developed nations. TV viewership continues to erode slowly. The press is struggling. Perhaps the WFA should add a ninth commandment addressing the need for a diverse, trusted and commercially viable media ecosystem. Without that, we have no business, after all. Best Western Hotels has teamed with IBM Watson Advertising to create a new, artificial intelligence-powered interactive ad. The Best Western Watson Ad aims to personalizes vacation planning by leveraging the consumer’s questions and use the answers to trigger additional questions, which the technology then uses to provide travel tips and make recommendations based on travel preferences. "This cutting-edge AI-powered ad will allow us to drive more meaningful engagement with travelers, while showcasing all that today's Best Western has to offer," stated Dorothy Dowling, senior vice president and chief marketing officer for Best Western Hotels and Resorts. "As the first hospitality brand to launch a Watson Ads campaign, we look forward to continuing our position as a frontrunner in innovation." Consumers can start a conversation with the ad by engaging it and providing information on upcoming or desired travel, which starts a series of dialogue prompts that guide the consumer through a conversation relating to travel needs. Watson AI ads use machine learning and natural language processing to make sense of unstructured data sets and enable two-way conversations. The location-based, augmented reality game relating to “The Walking Dead” is being launched globally on July 12, according to AMC and Next Games. “The Walking Dead: Our World” lets players fight walkers on the streets, in a park or in their living room. The AR app will be available for iOS and Android. The game was announced earlier without a release date. 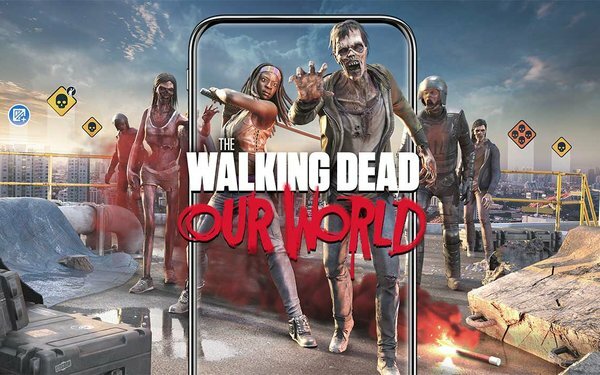 Like Pokémon Go, the game lets players see characters, in this case zombies, and take pictures or shoot them, as shown in a video from Next Games, the developer of “The Walking Dead: No Man’s Land” and the latest AR game. Players can team with others to join weekly challenges as they collect characters in the app. “Players won’t need to face the apocalypse alone; with Rick, Daryl, Michonne and all their favorite characters from “The Walking Dead” fighting by their side,” stated the announcement by AMC. Jurassic World also recently launched an augmented reality mobile app to help promote the movie. Verizon is officially pulling the plug on its go90 video app. The company will shut down the service on Saturday, moving its content to its Oath media properties, including Yahoo and Huffpost. The shuttering of go90 is not entirely surprising. In February, Oath CEO Tim Armstrong said the company planned to shift the content elsewhere. “The brand will remain. I don’t know for how long, but for now it will remain,” Armstrong said at the time. Go90 launched in late 2015 as a free, ad-supported mobile streaming video service geared to consumers who watch content on their phones. Despite a significant push from Verizon that included spending millions of dollars on original programming, it never quite gained the traction that other free streaming services had.